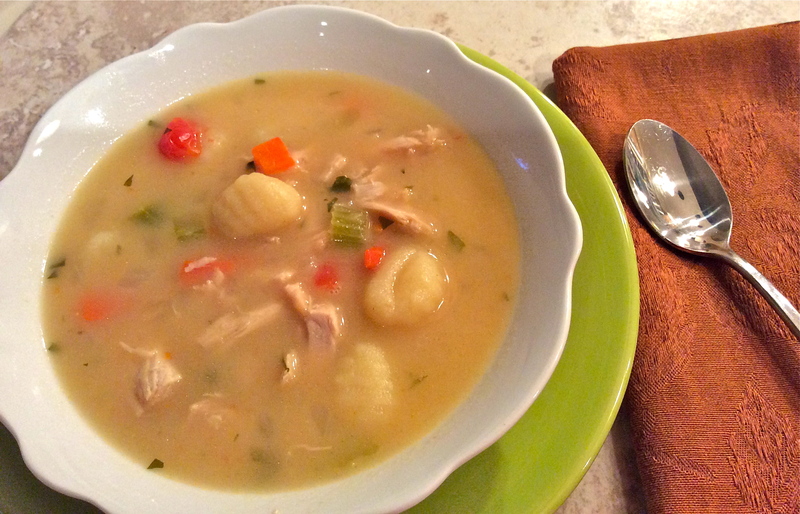 There must be hundreds of turkey soup recipes floating out there to help use up your leftovers from Thanksgiving. This is the first time I ever made by own turkey stock, as I usually just use a carton of chicken broth. I was amazed at how prominent the turkey flavor was by making it from scratch. It has to cook for about 4 hours, so it takes time, but the prep work itself, is minimal. The biggest part of prepping this soup is all the chopping up of vegetables. You can go about this in two ways: 1) make extra chopped onion, carrot, and celery when you are preparing your stuffing the day before. OR #2 is, you can purchase a package of Mirepoix (which is the French term for diced onion, carrot and celery mixture.) I chose to buy the Mirepoix and save time. 1. Remove all the turkey meat from carcass – dice and shred it and set aside. 2. In a large pot place the turkey carcass and any wings and cover with 3 quarts of cold water. Add the onion wedges, diced carrots and celery from ONE Mirepoix container, watercress, salt, peppercorns, parsley, and bay leaf. Bring this to a boil and then turn down to low so the soup simmers for 4 hours. While it is simmering, periodically remove any foam that rises to the top. 3. 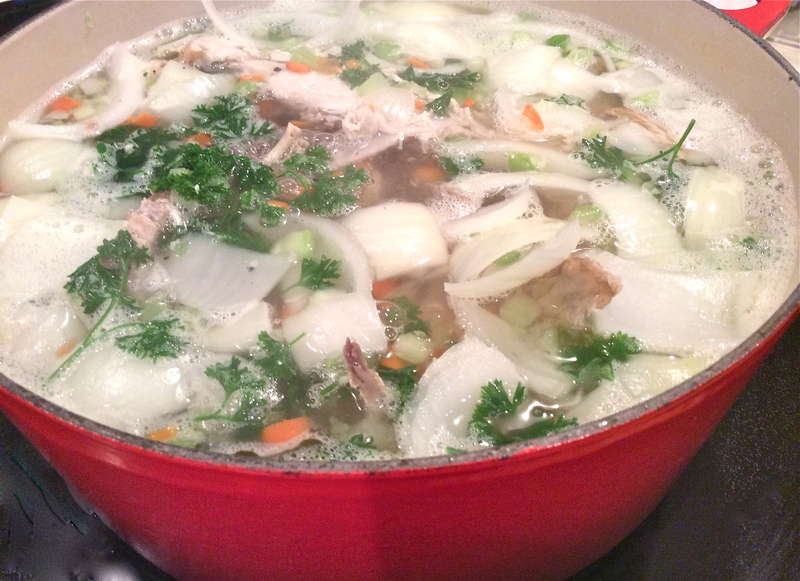 Cook the stock for 4 hours, then turn it off and let it cool down to a medium heat. Once cooled, remove the carcass, wings, and large pieces of vegetable and throw away. 4. Strain the stock through a fine sieve into another soup pot. Set the pot back on the stove and add in the butter, and sauté the vegetables from the SECOND container of Mirepoix including the diced onion. Once the vegetables are cooked through and begin to brown add 2 Tbl of flour and create a roux. Blend the flour well, and add back in the stock, stirring quickly as you add each cup till all the stock has been added to the vegetables. 5. Put the soup back on the burner, add in the cooked turkey and bring to a boil – then turn down and simmer for 30 minutes or until the vegetables are cooked, but NOT mushy. Half-way through add in the tomatoes, so they only cook about 15 minutes. 6. Once the vegetables are cooked, turn up the heat to high and drop in the gnocchi – they will float to the top once they are cooked – but this only takes about 2 minutes so don’t wander off or you will miss their rising to the top. Soup is ready!